Dental Associates of Marlborough provides dental implants to replace missing teeth and restore function and beauty. 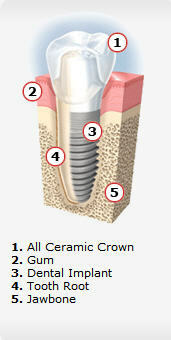 Dental implants are long lasting, resistant to wear and tear, and provide a strong foundation for dental restorations. With this advanced treatment, it is possible for patients who have lost one or more teeth to have a full smile. Dr. Sanjiv Nehra pays close attention to jaw bone density and overall oral health, two important factors in dental implant placement and restoration. In some cases, patients may need preparatory procedures to ensure the best chance at success. X-rays and impressions of teeth are taken, which help our doctor and team plan the procedure. Our practice is passionate about restoring the beauty and function of patients’ smiles through implant dentistry. Dental Associates of Marlborough offers patients comprehensive dental implant care in Marlborough. Call us to achieve a beautiful smile.